Add value to any lure with our super high quality realistic soft 3D eyes. Available in 8 sizes and 8 colours. Eyes not shown actual size. 3D LURE EYE COLOURS - 5/32" to 1/4"
Wow! Make all your baits come alive with these premium peel and stick soft plastic molded 3D Eyes. Ideal for use on your crankbaits, Ultra Spinnerbait, Ultra Minnow Jig and Round Socket Eye Jig and many other jigs and lures. These eyes are molded in 3D and really make a big difference on all of your lures! Very realistic! 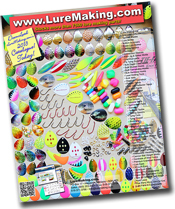 3D Lure Eyes Colours - 5/16, 3/8" and 1/2"
Wow! Make all your baits come alive with these premium peel and stick soft molded round 3D eyes with Oblong Pupils. Ideal for use on your spoons, spinners, crankbaits, Ultra Spinnerbait, Ultra Minnow Jig and Round Socket Eye Jig and many other jigs and lures. Very realistic!